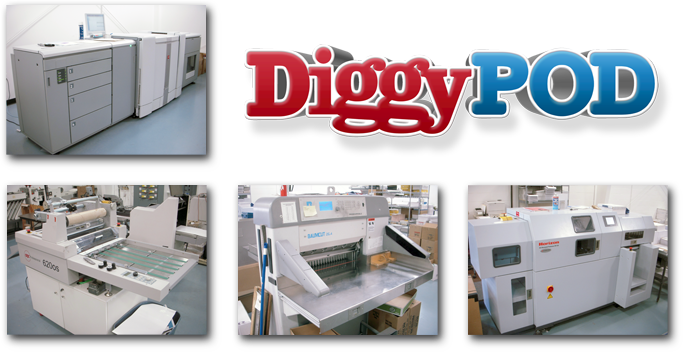 DiggyPOD was originally a small printing business called Quickprint, Inc. and was started in 1988 by Laura Alexander and three partners. Over the years the company served the local Saline, MI market and became the preferred print shop for the area. In 2001, Tim Simpson bought the Quickprint business from Laura and changed the name to DiggyPOD, Inc.(DiggyPOD stands for Digital Print on Demand). DiggyPOD is now located in Tecumseh, MI, which is a small Midwestern town about 30 minutes from Ann Arbor. We believe that our success is based on the small home town customer service that we give and live by. All of our employees go the extra step to make sure we are exceeding your expectations. We enjoy working with first time self publishers as well as established book publishers in providing great looking books from quantities of 24 to 2000 books. You have put many hours of hard work into your book, and this is why DiggyPOD uses state of the art digital equipment to give you the quality that your hard work deserves. We can also print your book in 48 Hours which is a great service for the publisher who needs their books printed quickly. Getting your book printed has never been easier!